Anyone who has ever stood in front of a classroom silently praying that their curriculum is engaging, their students are comfortable, and their jokes don’t skip a generation can tell you: Teaching isn’t easy. It’s some secret blend of intuition, strategy, and deep breaths. Great teachers aren’t measured by how much they know about the brain any more than great artists are measured by how much they know about the reflective properties of light: knowing how to use it trumps knowing how it works. So why do we think it’s so important to use research in the classroom? Why am I spending all my time hanging around the places where education and neuroscience overlap? Well, put simply: I think it can help. And I’m not the first. For generations, teachers have been drawn to learning more about the engine that runs the minds that they’re shaping. And researchers have believed in the power of knowledge to improve the way we teach. We have the instinct that the more we know about how things work, the better we’ll be able to control or optimize them. And for generations this has led to a somewhat rocky relationship between the researchers who can describe a student, and the teachers who can inspire one. Sometimes toes get stepped on, sometimes lines are crossed or miscommunications abound… and sometimes, it works. 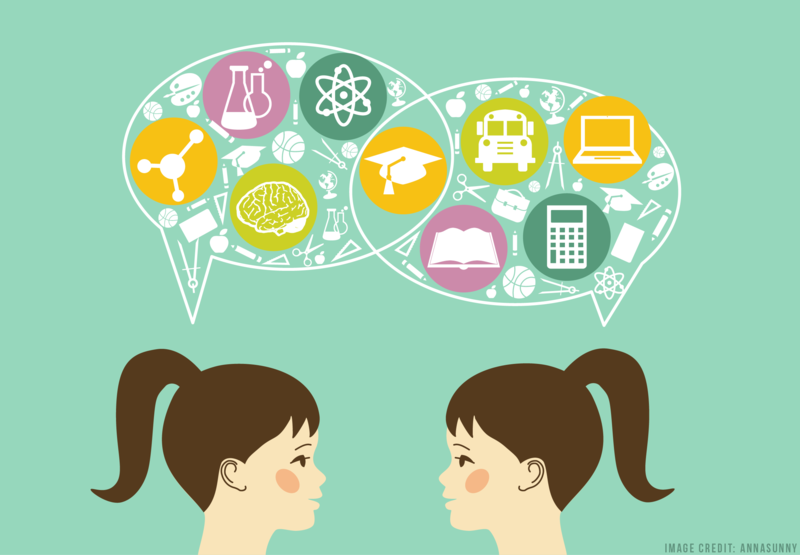 So I decided to take a look back at a few of the ways that research has influenced education, and what that can teach us about getting this important relationship on the right track. (350 BC) Aristotle and the meeting of science and education. At the same time, he was a dedicated educator, and he applied his love of the measurable to his pedagogical beliefs. He started a school, which was built on his view that nature is best understood through structured evidence-seeking and reason. He was an early advocate for ideas that have since transformed into a slew of modern buzzwords; he believed experiential learning, educational equality, lifelong learning, and public access to education were essential components of an ethical society. His fact-forward approach to inquiry even snuck into his moral teachings through the concept of “phronesis”: a type of practical knowledge that maintains that being a good person requires taking a bit of a motivated, scientific approach to moral decision-making. Aristotle believed in fundamental ways of knowing that informed both his investigation of nature and his approach to teaching. As a foreshadowing of professional-learning-communities-to-come, he believed that teaching itself ought to be informed by the collected knowledge of those who have taught. Basically, he’s not only one of the first scientists, but also one of the first advocates for the ways that what we know should directly influence what and how we teach. Admittedly, Aristotle was a far cry from applying neuroscience to the classroom, but his proclivity for fusing analysis, evidence, action, and learning continue to shape the way we think about education today. (19th-20th century) The empirically-informed standardization of learning. We’ve all heard critics of the modern educational system summarize its shortcomings as an out-dated “factory model of education”. They’re usually referencing things like standardized assessment, IQ testing, age grouping, and the one-size-fits-all approach. Most often, the blame is placed on late 19th century adoption of the Prussian-Industrial model in the US, claiming it prioritized conformity and efficiency above all else. Of course, it’s not really that simple. The 19th century was a time of great flux for public education. Competing models were emerging to solve the most pervasive problems of the day: inconsistent content, unclear standards, and a lack of equal access. By the mid-19th century, the inaugural Secretary of the Massachusetts State Board of Education, Horace Mann, made it his mission to empirically evaluate existing domestic and international models and to lobby for the full implementation of the one that best suited the nation’s needs. Enter: the Prussian-Industrial Model. This model was first crafted by King Frederick William I as a state-mandated program, arguably crafted to cultivate an obedient and submissive public. Teachers were stripped of autonomy and held to strict standards uncommon to the “sage” or “mentor” models of the past. Sure it was rigid, impersonal, and reeked of indoctrination, but it also ticked off the boxes that mattered most to Mann. It was cost effective, scalable, inclusive, consistent, and prioritized teacher training; features he argued to be necessary for public education to thrive. If he leveraged this powerful system for good, he believed, society as a whole would benefit. Of course, once this ball started rolling, it seems, Mann’s best intentions couldn’t hasten the inertial appeal of standardization or the emergent needs of the new system. As the Department of Education and similar bodies came into existence, the ambition to continue to improve our approach and evaluate progress intensified. But the new model catalyzed major increases in student-to-teacher ratios; how do you properly evaluate groups of students that large? Policymakers wanted data. They wanted to know what was working, what wasn’t, and what different students knew. By the early 20th century, research on human development, learning, and memory aligned with the goals of evaluators. The complicated entangling of research and education was well on its way as psychologists and educational strategists were recruited to design blanket assessments for growing classrooms. One of these tests, the Binet-Simon test, was created by French psychologist Alfred Binet to determine the mental capacity of students so that those with severe difficulties could be properly accommodated. That’s it. This whole mess of an IQ debate started with the earnest goal of capturing a snapshot of a particular child’s abilities and responding accordingly. Binet was clear: intelligence is diverse, complicated, and unlikely to remain static over the lifespan. Unfortunately, not everyone was listening. Henry Herbert Goddard, a US psychologist, caught wind of the Binet-Simon test and translated it into English. He went on to promote its use as an intelligence assessment tool, going so far as to encourage the sterilization of those deemed “feeble-minded” by its measure. Stanford psychologist Lewis Termin who adapted the test to create the Standord-Binet version (now in its fifth edition), also believed that intelligence was an inherited and fixed trait. The result was a national effort to rank students, citizens, and immigrants against each other, with sometimes dire consequences. Selfies and Netflix consumption aside, it’s safe to assume that people haven’t fundamentally changed much since the days of Aristotle. We’re still susceptible to the same biases, assumptions, and miscommunications that we were in the 19th century. Of course, we have the added benefit of learning from everything that’s come before us. So the question is, how do we make sure that research is used wisely? Well, for starters, we have to talk to each other. If someone had asked Binet before implementing his test, he would have likely clarified how to use it reasonably. If someone had asked experienced teachers before they assumed a single standard for quality, they would have likely clarified the value of adapting to your students. The problem is that information doesn’t exist in a vacuum and expert does not mean right. We’re all constantly interpreting research to match our own goals, experiences, and understanding of the world. We are much better at hearing what we want to hear than we are at listening to each other. I find that reality is usually somewhere in-between. Neuroscience is unlikely to create great teachers, great tests, great classrooms, or great curricula – that’s not its goal and that’s not something I expect anyone to bottle up any time soon – but it can inform the way we think about students and the nested communities that they’re a part of. It can teach us more about ourselves, how we interact with information, and how we interact with each other. It can be one of many tools we use to get this right. And frankly, that’s all we should ask of it. When thinking about history, we first have to consider whether the actions that look foolish in retrospect were actually reasonable reactions to the problems of the day. Sometimes it’s successful, and sometimes it’s not. By putting ourselves in their shoes, we can empathize with their mistakes, and more easily imagine ourselves making them in similar circumstances. Education and science are similar in that both can be a reflection of the society that supports them. Every solution has flaws, and often, the solution to one problem ends up causing a whole slew of new ones. The power and perceived credibility of research was well-received by a system that felt haphazard and disorganized. The problem is, that same research viewed through different lenses can have drastically different consequences. In the case of standardization, history reminds us to both embrace the insights research may offer, while also being wary of the agendas that may be shaping its use. Similarly, neuroscience is valuable to education, so long as we understand its limits and the biases of those who are disseminating it. If we adopt it blindly, then we run the risk of misallocating resources or creating more problems than we solve. Recent studies suggest that the majority of educators continue to believe neuromythologies, and the problem is, they didn’t come up with those themselves. Someone else told them that students are left-brained or right-brained. Someone else told them that boys and girls are born with totally different brains, or only use 10% of it, or that Mozart will make you smarter. The list goes on and on, but the point is, as history has shown us, society (and in this case mass media and capitalism) will often shape the message. It’s up to us to find ways to make sure that the darker side of history doesn’t repeat itself. Stephanie specializes in the “in-between stuff”. She has a knack for synthesis and collaboration — putting pieces together in novel, strategic, and complementary ways. As Executive Director of The People’s Science, she leads the development of interdisciplinary educational programs aimed at breaking down barriers between science and society. She also works as a consultant, designs informal learning environments, creates online curriculum, and leads seminars at Harvard Graduate School of Education. A researcher by training, she also works in the Affective Neuroscience & Development Lab at Harvard University, where she spends her days learning about social and emotional development across adolescence and into early adulthood. The end game? Leverage our understanding of self, others, and the nature of 21st century information to develop programs that make the world a little nicer than we found it. In her free time, she designs super nerdy stuff.